As one of the well-known conspiracy theories accus the fasification of the landing , another version of skepticism of the outer space age says that NASA sent, indeed, men on the moon, but remained quiet about extraterrestrial intelligence discovered by astronauts here. These premises conspiracy gave rise to new scientific disciplines, exoarheologia, the study of alleged alien artifacts from other planets in our solar system. In the summer of 1996, this branch scientific community received an extra boost from NASA when the space agency announced that it has discovered a meteorite that contained microscopic formations that resembled fossilized unicellular organisms; and meteorite discovered in Antarctica years ago, was probably coming from Mars. These ancient Martian bacteria are far from being a relic consistency, but spatial archaeologists have interpreted the episode as a sign that they were on the right track. Without having the advantage of direct access to the relics and artifacts photographed by NASA on other celestial bodies, Earthbound exoarhelogii are often required to extract information from fuzzy images random made by space probes without human on board. By virtue of the inherent handicap of such approaches to science, a dedicated community of scholars, followers of conspiracy theory, built a grim scenario: both the Moon and Mars were once intestate by alien architects and builders who may still be there today. However, around Mars Cydonia region revolve speculation that NASA would strongly try to mask the truth about the lost city of Mars, hiding important pictures and even sabotaging their own missions. Such a situation has been recorded in August 1992, during the space mission Mars Observer, which had among its objectives the achieving of high resolution photos of the Cydonia region. Then, right before entering the orbit of the Red Planet, the space probe stopped transmitting signals to Earth. NASA quickly abandoned the mission, accusing a waste of fuel. Conspiracy theory shaped around this story claims that NASA had to destroy the Mars Observer probe to keep the secret on what was Cydonia hiding. Or there was another force, of alien origin who launched an attack on the spaceship. These theories were strengthened by what happened in Russian missions case, that was also intended the observing of the Red Planet. In the late 80s, the former Soviet Union sent two spaceships to Mars without crew on board, Phobos 1 and 2, with the intent to photograph the planet and one of its moons, Phobos. The first probe has suffered a technical malfunction on the way. In 1989, Phobos 2 reached its destination and made extensive photographs of the Martian surface, which after it ceased the activity. In one of the photos sent to Earth by this second probe, however, one can see a shadow of a cylindrical shape, outlined on the surface of Mars. A number of researchers in the shadow conspiracy claim that this sahadow was thrown by an alien spaceship just before the Russian probe sweep. Scientists specialists in planetary system explained this phenomenon as a projection of Mars moon Phobos, a natural satellite of irregular shape. Following these events, Hoagland will return again in front, offering a number of interesting documents kept secret for 30 years. The first was a report from NASA that it is recommended that any future discoveries concerning extraterrestrial life to be kept secret in order to not disturb the earthly civilization of the twentieth century. The second was a strange annex to the NASA status in which was stated that the American space agency is a branch of the military institutions. But Hoagland will not settle only to present these documents, commenting that they served to the deliberate masking of a superpower for 30 years, to keep people in the dark about the amazing discoveries on the Mars and the Moon. William L. Brian II, author of the book “Moongate: the secret discoveries of the space program of the United States,” released in 1982, and he will make an appearance in the “theater of war” of conspiracy theories, sketching a similar landscape of things. Brian has proposed himself to make an investigation of machined hiding by NASA of the alien intelligence on the moon. The basis of its argument is that NASA is lying when claiming that the moon’s gravity is six times smaller than the Earth. This way Brian wants to show that NASA discovered in the 60s, about the lunar gravitational field that it has, in fact, 64% of the terrestrial force. The implications of this discovery are, according to Brian, scary enough to stimulate a cover by NASA. If the gravitational attraction of the moon would be really close in value to that of the Earth, Newton’s law of universal gravitation would be entirely wrong and conventional physics would be based on an uncertain foundation. Moreover, the author argues that a strong gravity of the moon would imply the existence of an atmosphere that would carry forward to the possibility of life, maybe an evolved one. Brian bases this theory especially on the fact that astronauts that landed on the moon couldn’t do jumps above 35 inches, height which in a gravity six times smaller than the Earth would be about two meters in the case of an individual with a weight of 180 kg, that the astronauts weighed equipped. Considering that the atmosphere, more dense than was said of the moon, could also be breathable, Brian even accused that the existence of astronauts costumes had the only role of hiding during filming, the real conditions on the Earth’s natural satellite. Further, marching on controversial evidence of Neil Armstrong, the first man on the Moon, the author argues that even when people have landed they were encountered and closely monitored by UFOs and even alien entity. Later, based on questionable and subjective sources , Brian will say about the moon that it is not a wasteland, as NASA says. The moon, he says, is actually a pleasant land, with a “saffron sky” with vegetation and life in certain areas, forested mountains, lakes and rivers and some alien communities. Brian’s theories will be echoed in another field of aerospace conspiratorial assumptions, the one called “Alternative 3”, which initially started as a fictional parody, but then took on serious proportions among the masses. 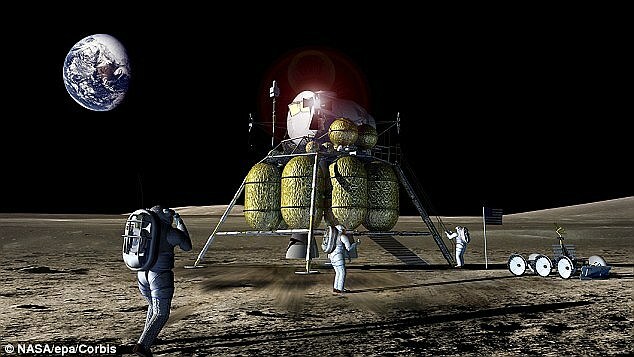 As how was exposed, Alternative 3 would be a plot conceived by a global meeting of elites targeting abandonment in the hands of the masses of the planet Earth, overcrowded and polluted, blue blood carriers being transported in secret from Earth, along with cohorts people who would represent labor, to the city-dome on the Moon and Mars. There are theories more than daring, at least paranoid premises and fears apparently irelevant, but if there is a solid pillar to support them, it is that issuers and their followers are taught people, trained and intelligent, whose conclusions aren’t quite questionable. However, celebrity hunters and success have rise from the clean ones lines and the suspicion of such a startup comes to demolish any accreditation of a promoter of conspiracy theories.